N.J. Burkett is live in the Bronx with the latest details. ALLERTON, Bronx (WABC) -- Less than two hours before an elderly man died in a housing authority elevator in the Bronx on Christmas Day, NYCHA agency was warned, an investigation found. At 2:38 p.m. on Dec. 24, 2015, a tenant of Boston senior houses in the Allerton section called to report the elevator was "very dangerous" -- that it was "going up and down by itself" with the door open, and when the door did close, "It slams real hard." A series of miscommunications led to NYCHA taking no action at all, the Department of Investigation discovered. The tenant's complaint was first listed as a "low priority." A secretary attempted to notify a supervisor, but left work at 4:30 p.m. that afternoon. 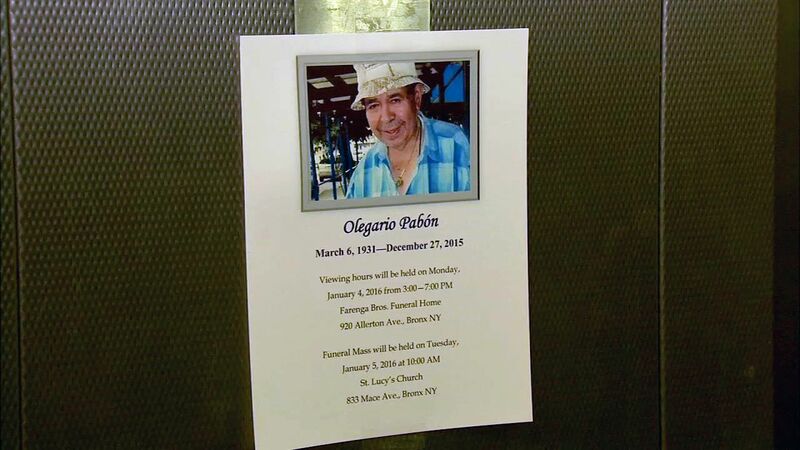 Two hours after the initial report was made, 84-year-old Olegario Pabon -- walking with a cane -- attempted to enter the elevator. It drifted upwards catching his leg and hand and ultimately led to Pabon falling out of the raised elevator. He died from his injuries three days later. NYCHA senior management did not learn of and investigate the incident until four days later. "One of these days, it's going to happen again!" said Rosa Torres, a resident. Residents are still traumatized months after their neighbor was killed in the building's elevator. "The elevator was going up and down and up and down. He was so scared, and he just wanted to get out. He pushed like this and the door closed on him and he hit his head and that's what happened," Torres said. But a report by the city's Department of Investigation now reveals that a complaint was called-in by a resident hours earlier. But NYCHA did not take immediate action after the complaint. And investigators uncovered "multiple lapses in communication" that the elevator's brake monitor (intended to control the elevator) had actually been disabled. After the accident, NYCHA inspected all 1,080 elevators with the same brake monitors, and found 80 weren't functioning. "NYCHA did not require mechanics to specifically examine and report on the condition of brake monitors," the report states. "On any given day a thousand people probably go up and down in the elevator, and with 80 of those brake monitors not working, that's a lot of people at risk," said Commissioner Mark Peters, Department of Investigation. Commissioner Peters says his agents found failures from top to bottom. "There was a systematic breakdown, this was not one bad case," Peters said. NYCHA and the city Buildings Department have stepped-up inspections and added new procedures and training. "Unprecedented measures," said NYCHA's spokeswoman, "to prevent malfunctions of this kind from occurring in the future. To ensure we never see a tragedy like this again." But residents say their elevators are still unreliable. "I'm scared to get onto that elevator!" Torres said. Less than a month earlier, according to DOI's examination, a similar accident at NYCHA's Morris Houses, also in the Bronx, trapped a resident's foot in the elevator door for over an hour until the man was rescued by FDNY first responders.